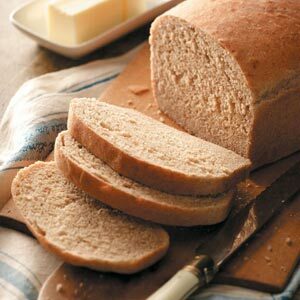 This is a hearty, and complete protein bread that is one of my absolute favorite meals. in large bowl, combine water, honey, oil, and salt. ad all flour and yeast. stir until well kneaded. about ten minutes. this is a batter type bread and will not form a smooth ball. pour dough into greased pans. let rise in warm place for an hour our until dough is 1/4 inch from the top of pan. DO NOT OVER RISE! will overflow pan while baking. bake a 350 degrees for 45-50 minutes in loaf pans. makes a complete protein in a tasty bread. Posted on April 4, 2014, in Uncategorized. Bookmark the permalink. Leave a comment.